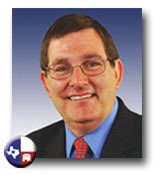 Michael Burgess is the Representative of TX-26. After spending nearly three decades practicing medicine in North Texas, Congressman Michael C. Burgess, M.D., was first elected to Congress in 2002, and re-elected in 2004, 2006, and most recently in 2008. Dr. Burgess serves on the prestigious House Energy and Commerce Committee and is the top Republican on the Subcommittee on Oversight & Investigations. He is also a member of two other subcommittees: Health Care, and Energy & Environment. He is a member of the bicameral Joint Economic Committee, and in 2009 Dr. Burgess founded, and currently serves as Chairman, of the Congressional Health Care Caucus. Because of his medical background, Dr. Burgess has been a strong advocate for health care legislation aimed at reducing health care costs, improving choices, reforming liability laws to put the needs of patients first, and ensuring there are enough doctors in the public and private sector to care for America’s patients and veterans. He has played an important role in bipartisan efforts to ensure the safety of food, drugs, and consumer products, and has introduced legislation to strengthen our ability to stop dangerous products from coming into the country. As a Member of Congress representing one of the fastest growing areas of the country, transportation is also a top priority for Dr. Burgess. He successfully amended the 2005 Highway Bill to include development credits, design-build, and environmental streamlining. During his time on Capitol Hill, he also has worked to build, maintain, and improve the safety of our roads, bridges, air service and transit in the North Texas region. A fiscal conservative, Dr. Burgess believes Americans deserve a federal government that is more efficient and effective, less costly, and always transparent. He follows a strict adherence to the Constitution, and opposes unnecessary expansion of the federal government’s control over Americans’ personal freedoms, and instead believes in giving people more control over their lives and their money. While in the House of Representatives, Dr. Burgess has received several awards, including the 2008 House Legislator of the Year from the Multiple Sclerosis Society; 2005 Legislator of the Year by the American Academy of Nurse Practitioners; the Guardian of Small Business award by the National Federation of Independent Business (NFIB); the Spirit of Enterprise award by the U.S. Chamber of Commerce; and the Taxpayer Hero award from the Council for Citizens Against Government Waste; among others. Today Dr. Burgess represents parts of suburban Dallas and Fort Worth. He was raised in Denton, Texas and attended The Selwyn School, graduating in 1968 as valedictorian. He graduated with both an undergraduate and a Masters degree from North Texas State University, now the University of North Texas. He received his M.D. from the University of Texas Medical School in Houston and completed his residency programs at Parkland Hospital in Dallas. Dr. Burgess also received a Masters degree in Medical Management from the University of Texas at Dallas, and in May of 2009 was awarded an honorary Doctorate of Public Service from the University of North Texas Health Sciences Center. Dr. Burgess has been married to his wife, Laura, for 35 years, and they have three children and a grandson.